Today Ubisoft shared some more details on their upcoming Assassin's Creed: Bloodlines game for the PSP. 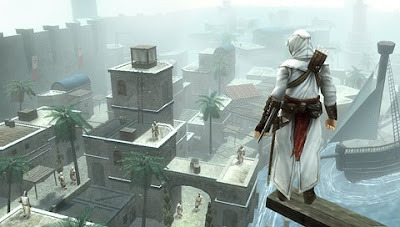 Bloodlines continues Altair's story from Assassin's Creed in his quest to hunt down the Templars in Cyprus. Ubisoft has shared a new trailer for the game as well as a Q&A with Producer Frederic Lefrançois. Here's the Q&A and game trailer. My name is Frederic Lefrançois and I’m 3rd Party Producer on Assassin’s Creed: Bloodlines. My role on this project is to ensure that this game releases on time for the Holiday at the highest level of quality. “Assassin’s Creed: Bloodlines” follows Altair's story right after the events of Assassin’s Creed as he hunts down the ascending Templars in Cyprus. It’s the only game that explains the link between Assassin’s Creed and Assassin’s Creed 2. If you want to understand how Ezio is born and where the Codex comes from you need this game.